I’m not a fan of the swimming pool. Maybe it’s because I’m not much of a swimmer. I can tread water long enough to say an Act of Contrition but hopefully I will never find myself in a position doing the 2 things simultaneously. Maybe it’s because I don’t relish the idea of being in a big bath with lots of strangers or maybe it’s because of the hassle getting undressed/dressed/sorting hair/visage etc. Okay maybe I’m just a big lazy lump! When I was a kid, I was blessed with a wonderful Mum who took my brother, sister and I weekly to the Little Ducklings session on a Friday evening in the Seven Towers Leisure Centre’s pool in Ballymena. Anyone remember that? We also went for lessons and I firmly believe that everyone should learn to swim (even if it does mean you can just tread water long enough to say that prayer…). My swimming lessons were grand. I think we went 2 years in a row and I was awarded certificates at the end of each year for swimming a whole 3 metres. Obviously, no improvement made after year 1 and here we are 30+ years later and still no improvement. However, there is another reason that I suspect I am scarred for life when it comes to the swimming pool and that is VERRUCA SOCKS. 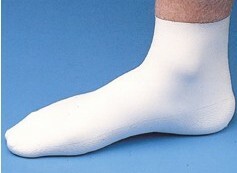 You know how some folk like to wear socks in bed? Well my Mum liked her kids to wear verruca socks in the pool even though none of them had verrucas! On our recent holiday this came up in conversation and while Mum was spouting prevention is better than cure, I had to point out to her that fellow swimmers must have thought the Devlin children had the plague with all 3 of them wearing verruca socks week after week with no sign of any one of their 6 feet healing up.